Shutterstock/Tyler OlsonMillions of pounds of ground beef are being recalled after being sold at stores including Walmart. Roughly 6.9 million pounds of raw beef are being recalled after being linked to a salmonella outbreak. The salmonella outbreak has sickened at least 57 people in 16 states, the Food Safety and Inspection Service announced Thursday. Millions of pounds of beef are being recalled because of food-poisoning concerns. The Tolleson, Arizona-based meat producer JBS Tolleson is recalling roughly 6.9 million pounds of raw beef products, the Food Safety and Inspection Service announced Thursday. 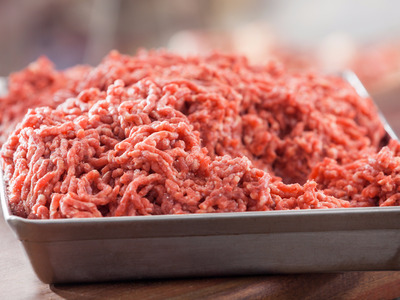 An investigation by the FSIS, the Centres for Disease Control and Prevention, and other public-health groups found that at least 57 people in 16 states had been sickened as a result of salmonella linked to the ground-beef products. The beef products were sold under numerous brands, including Cedar River Farms, Comnor Perfect Choice, Gourmet Burger, Grass Run Farms, and Showcase, which is sold at Walmart. A full list of the brands and how to identify potentially contaminated ground beef can be found on the FSIS website.